There are some artists we have covered that I feel truly privileged to bring to our readership, especially when it may be for the first time. I know when somebody turns me on to something new, or just new to me, that can often be very important or helpful to me at that time. 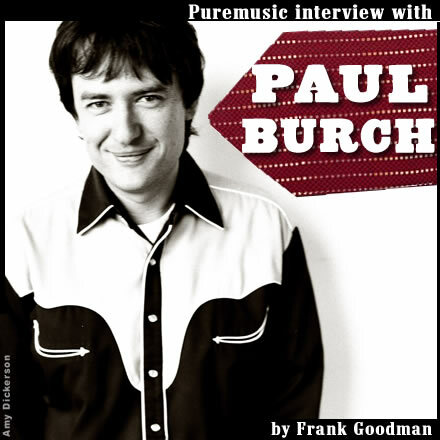 There is a soulful purity to the music of Paul Burch that is nourishing on a cellular level. He knows so much and he feels so much about this music that it's running through the lyrics and the melodies, and most undeniably in his singing. Remarkably, he just doesn't sound like anybody else. That must be why he makes an immediate and a deep impression on musicians as luminous as Ralph Stanley and Mark Knopfler, who both appear alongside Paul on this latest record, East To West. In fact, half the recording was done in Knopfler's new London studio. The rest was cut at Wow And Flutter, the studio of guitarist Joe McMahan (who some are familiar with for his work with Kevin Gordon). Paul's crew, the WPA Ballclub (Jim Grey on bass and Marty Lynds on drums), were presiding, and the indomitable Kelly Hogan was singing backup, to understate the case. Tim O'Brien branded the proceedings so indelibly, singing and stringing so memorably on a couple of tunes, I thought he was on half the record. The odd couple of George Bradfute and Richard Bennett on baritone guitar and electric and tres, respectively, made a huge difference. Jen Gunderman on Wurlitzer, Dennis Crouch on upright, Fats Kaplin on fiddle, every choice is a classic. On the Ralph Stanley cut, the duo are joined by James Shelton on rhythm and Steve Sparkman on banjo, from The Clinch Mountain Boys. On the weekends, if I'm in Nashville, I can always be found at brunch at The Red Wagon on the east side of town, owned by Paul and his lovely wife, Meg Giuffrida. When I see Paul strolling through (if, indeed, he's in town) with young Henry in tow, it's easy to forget what an awesome musician and songwriter he is. And then you listen to his new record, and are truly amazed, all over again. Get this record, and turn your friends on to it. And check out the artist's website to find out more about this unusual and compelling character.